The Welding program at GIFT provides the opportunity for students to develop the skills necessary to enter the welding trades. Students who complete our program will be prepared to handle welding and cutting tools, will understand the differences in and uses for various metals, and may even develop the supervisory skills needed to become a shop manager. What Do Welding Graduates Do? A welder fuses materials such as steel and aluminum together to create mechanisms or to fix things that are broken. They often use CADD software to create or manipulate plans and commonly use equipment such as stick welders and cutting torches. Some jobs require past experience, while others offer on-the-job training for entry-level welders. Math skills, manual dexterity, and the ability to use hand and power tools is needed. Attention to detail and self-motivation is also necessary. Basic welding and machine fabrication that stresses theory and application of fundamental welding and soldering techniques. Students will receive exposure to stick ARC and MIG welding, sheet metal layout, and the use of a plasma cutter in this two to three credit course. An introduction to the concepts and tools used in Fab Lab environments, this two-credit class covers safety procedures, machine setup and operation, and costs associated with fabricated items. 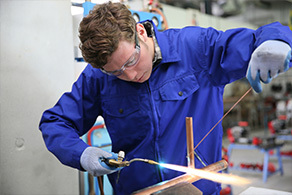 This three-credit course covers welding processes and techniques used in modern industry with the intention of preparing students to complete the AWS certification test. A three-credit class that focuses on understanding the machine tool industry and the processes used in producing metal products. Includes work with the lathe, mill and surface grinders, and hand tooling. This three-credit class demonstrates arc welding principles and techniques, including metal prep, equipment setup, and metal-specific techniques and positions. Prepares students for entry-level certifications with the AWS. Advanced work with manual tools, mills, the lathe, surface grinders, and CNC machines to produce prototype parts from industry drawings. This four-credit course also explores work opportunities related to the field of manufacturing. Class meets daily from 7:35 to 9:00 a.m.
Students enrolled in the Welding program through EAC may work towards their associate’s of applied science degree. This degree requires a total of 46 Welding curriculum credits plus general education requirements and a GPA of 2.0 or higher. Students may earn a welding and manufacturing fundamentals certificate by successfully completing 20–21 welding curriculum credits and demonstrating mastery on both the EAC writing and math placement tests. Students may earn a welding technologies certificate by successfully completing 30 welding curriculum credits and demonstrating mastery on both the EAC writing and math placement tests.